I know that summer is way OVER. But hey, somewhere out there is still having their summer! Ahahhahah and who wouldn't agree, you can always enjoy the beach even if it's not summer. The beach always has the most beautiful sunset! I had been thinking of going to the beach soon, however in my part of the country it's still raining. 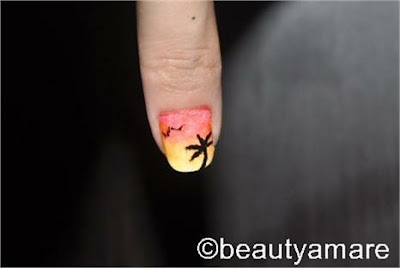 So instead of heading out, I re-created the beach sunset in my nails! 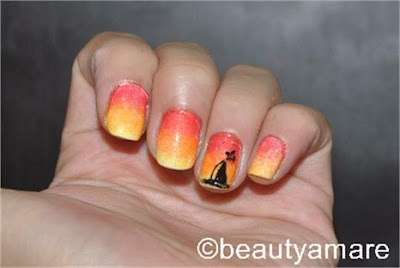 For all of those beach sunset fanatics, here's how to re-create this design. STEP 1. Prepare your nail lacquers, base and top coat, foam and nail polish remover. 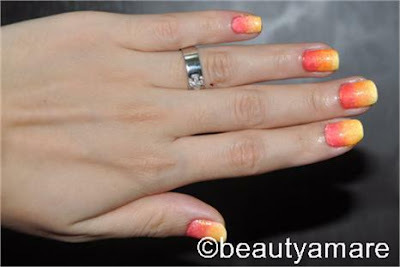 To recreate the sunset colors, prepare your yellow, orange and pink lacquers. STEP 2. Prep your nails by painting your nails with your base coat and 2 coats of your white lacquer. Let your nails dry for about 15 minutes. STEP 3. We will be using the OMBRE technique using foam, either you can have your make-up foam or your regular dishwashing foam. I really don't use a make-up foam so i'm using the dishwashing foam, which is fine for this technique. Paint your foam with the pink, orange and yellow lacquers. STEP 4. Dab the foam in your nails, and completely cover your white canvass with all these colors. Then immediately paint your top coat to melt the colors and give your design a nice OMBRE effect. STEP 5. You can actually stop in step 4 to give you that nice ombre design, which by the way is very popular now. Or you can draw in birds, coconut trees, sail boat or dolphin shadows to finish the beach sunset inspired design. Don’t forget to join beautyamare.com for more Beauty and Nail Art ideas.